"What are dry scallops?" I asked Carl pointing to the sign next to large plump scallops. "Are you ready for the fish lesson of the week?" said Carl pulling a few scallops out of the fridge case and setting them in front of me. I have probably been to New Deal a hundred times, and I am yet to walk out with just fish. 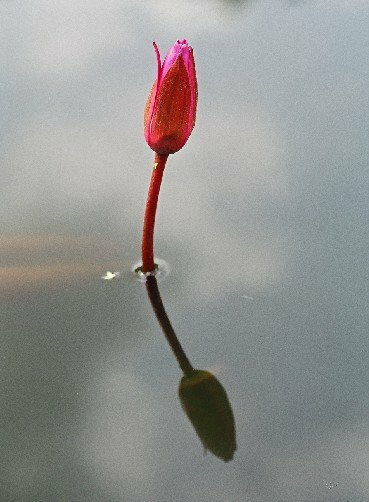 There is always some interesting lesson to take away as well. "When scallops are labeled 'dry,' it means that they haven't been soaked in sodium tripolyphosphate (STP) to prolong their life." Before you panic, let me clarify that STP is FDA approved and food safe so it’s not some dangerous chemical you are ingesting with your scallops. What is the problem then? The problem is, Carl explained, that soaking scallops in STP causes them to absorb water and get heavier. What does that mean to consumers? It means that you are partially paying for water. Water... the bells went off in my head -- so that's why there is a puddle of liquid in my pan sometimes when I try to sear scallops. Hmm, guess where I am getting my scallops next time I want to sear them? The reason I was getting the scallops this weekend though was to make scallop ceviche. Ceviche is a popular Latin American appetizer of seafood cured in lime juice. The scallops will be only partially cooked, so make sure you buy them from a reputable source. You can dress this dish up by serving in it martini glasses, or just set a big colorful bowl in front of your guests and serve your scallops family style. The tart, sweet, and spicy notes make it a perfect match for a Riesling. On a hot summer day, there is nothing better than a bowl of cool scallops pillowy soft and sweet. Remove the tough muscle from the sides of the scallops. Slice scallops horizontally into 1/3 inch thick circles. 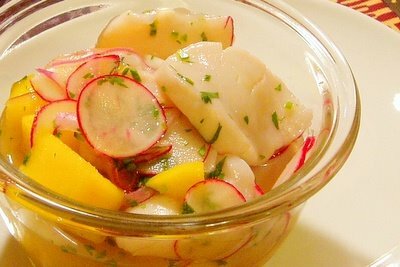 In a large non-reactive (glass or stainless steal) bowl, combine scallops, lime juice, orange juice, jalapeño, onions, mango, radishes, cilantro, and salt. Mix well. Cover and refrigerate for 2 hours stirring half way through. Taste and add more salt if needed. Serve within 24 hours. Variations: Besides mango and radishes (or instead of them), you can add sectioned oranges or grapefruits, thinly sliced sweet peppers and cucumbers, and even diced watermelon. This looks delicious, Helen. I'm going to see how easy (or difficult) it is to find dry scallops out here in the Pacific Northwest. And thanks for the wine tip, too! This is so interesting, Helen! I always wondered why they released so much water when cooking! Thanks for the info! The cerviche looks fabulous! For a moment, I thought I was going to see some fusion food when I saw the word 'dry scallop'. Many Chinese in Asia uses dried scallop for cooking in soup, porridge etc. And they don't come cheap too. I've learnt that there are 'dry' scallops which are not 'dried'. No matter how well I wash scallops, I always feel a little grit in my mouth. What am I doing wrong! My theory is that the grit is in the muscle and can't be washed out. You do not need to wash scallops, fish or any other protein. If your scallops are gritty, I would try finding another fishmonger. Next time I am in my favorite fish market, I will ask Carl about why some scallops are gritty. Thanks Helen, just fyi - I bought them at Whole Foods. but I would like to hear what Carl would have to say. This sounds delicious... we love ceviche - our favorite is probably conch ceviche (conch salad) in the Bahamas. It cures what ails ya! This sounds great, but I'm a little confused. The blurb above says that the scallops will be partially cooked, but the recipe doesn't seem to cook them at all. Which is it? They are chemically cooked with acidity in the marinade. It's called "curing" -- cooking that happens without application of heat by use of salt, sugar, and/or acid. And when scallops aren't available at a reasonable price. I use med/large shrimp and do the same. You can also use cod that's been cooked and chilled (lower cost). Also good is Tilapia - cooked and chilled (when I say cooked, poached).